Easter Sunday’s in a couple of days. When I was growing up, it was a huge to-do. Me and my sisters all got brand spanking new dresses (most of which were pretty ugly because, 90’s kids fashion) and shoes. I had a great mom who usually made sure we also got Easter gift baskets to wake up to. We’d go to church, where the services were specially centered around the Resurrection. Then it was back to my grandparents’, or a restaurant where there was a nice brunch or dinner that would give us all food comas for the rest of the day and evening. Nowadays, things are much… quieter. But if there’s still something I do try to keep going for myself at Easter, it’s good food. That, you never grow out of. Making Easter bread is something that’s become somewhat of a yearly tradition for me. I do it because there are quite a lot of different types from various cultures and places to try. I do it test and improve my bread making skills. I do it because most of them are really yummy and not too difficult to pull off. I do it because I like it. I’ve mentioned before that I’ve always had a ‘thing’ for hot cross buns ever since I was a kid and heard about them for the first time in a British nursery rhyme. They just looked yummy in the picture and for years, I always wondered what one would taste like. I recently read a comment on another food blog that called them the first and earliest ‘food fad’, which I thought was funny. It was two years ago I think, when I took my first shot at making Hot Cross Buns for myself. Mine had a slight twist on the original with the addition of chamomile tea to the dough, which gave them a delicious flavor. I decided then and there that it wouldn’t be the last of my hot cross bun baking. This HAD to happen again. I briefly considered just making plain Hot Cross Buns, but then I noticed a recipe on Williams-Sonoma’s blog that looked very intriguing; Hot Cross Buns translated into a a single loaf of bread. I don’t know what it is about me, but I have trouble sticking to the ‘script’ of a recipe if I feel comfortable with it. I just can’t leave well enough alone. The original recipe just called for a single rectangle of dough to be rolled up then placed in the loaf pan and baked off to form one swirl. Yeah, I know. I didn’t do that. Look guys, I know it looks complicated, but it isn’t. Really. I started with the one cylinder, then randomly took my bench scraper and split it in half. I then used it to split THOSE halves in half. Then, I just arranged the individual cylinders side by side in the loaf pan with the cut side facing the pan. That’s it. You let the loaves rise and get puffy, then bake them off where they actually rise and get even MORE puffy. Then by the time they’re done and cooled off, BAM. You’ve got a loaf of bread that not only smells amazing, it’ll have everyone you share it with scratching their heads wondering how the heck you pulled this off. Now, let’s get down to taste. I added a cup of whole wheat flour to the dough, which gives it that hearty, nutty flavor that I personally love. Cinnamon, cloves and nutmeg give it an ‘umph’ of warm comforting spice that will make your kitchen smell like a bakery. The sweetness of the dough’s cinnamon brown sugar filling is also very well balanced from the tartness of the cherries and/or currants and the orange zest. You don’t have to add the icing, but come on: why WOULDN’T you add it? Icing is one of life’s pleasures and don’t you try and say it’s not; no one believes you. There are so many ways you could eat & enjoy this bread. Plain and all on it’s own. Toasted & smeared with butter & jam. Sliced very thick and used for FRENCH FRIGGIN TOAST. You could even use the leftovers (should there even be any because, I mean, come ON) as the base for a delicious bread pudding. Quite simply guys, this bread hits allllll the right spots. Find out which one is yours, asap. Happy Easter, Resurrection Sunday, Passover & Fiesta Friday #167. In a small saucepan melt the butter over low heat. Add the whole milk and white sugar and heat to 110°. Pour this into the bowl of a standing mixer. Sprinkle the yeast on top. Allow to sit for about 10-20 minutes, until mixture is frothy and proved. Meanwhile, in a medium bowl combine the flours, cinnamon, cloves, nutmeg and salt. After yeast mixture is ready, add the dry ingredients to the mixer bowl, and combine using the dough attachment, about one cup at a time. Add the eggs, cherries and orange zest and continue to allow to mix/knead on medium for about 10 minutes until dough pulls away from the side of the bowl and is smooth. Grease the bottom of the bowl, place dough back inside. Cover with plastic wrap & a damp towel and set in a warm place to rise for 90 minutes to 2 hours. Meanwhile, spray two 9 x 5 loaf pans with cooking spray and line with one wide strip of parchment paper or aluminum foil each; spray the paper/foil as well. Sprinkle a small amount of flour or powdered sugar on a clean surface. Punch down the dough and divide in half. Keep the other half covered with the plastic wrap while you work with the first. Flour a rolling pin & roll out the half to an 8 1/2 inch rectangle. Combine the softened butter, light brown sugar and ground cinnamon together in a small bowl and mash with a fork. Divide the mixture in half. Using a spatula & your fingers, spread and press the half of the sugar mixture over the dough evenly. Starting from the short end, roll the rectangle into a cylinder as tightly as you can, pressing the seam securely to seal. Using a sharp knife or a bench scraper, divide the cylinder in half, then divide each half into four rolls. Place the rolls, cut side up in the bottom of the loaf pan in two rows of four. Repeat the above process with the other half of dough. Cover both pans with plastic wrap and a damp towel. Let rise in a warm place until rise and puffy, 60-90 minutes. Preheat oven to 350. Place a shallow pan of water on floor or bottom rack of the oven. In a small bowl, combine the beaten egg and the water. Using a pastry brush, brush the mixture over both loaves. Place in the oven and bake for about 35 minutes, covering with foil if browning too quickly on top, until inner temp of the loaves reaches 195°-200°. Allow to cool in pan for about 5 minutes, then use the sides of the parchment paper or foil to lift out of the pan. Allow to cool completely on a wire rack, for about one hour. Combine the powdered sugar with the milk and vanilla until slightly thick. Use a fork to drizzle the icing over the top of the loaves. Allow to set for about another hour before slicing thick and serving with butter or jam. Omg! Soooo gorgeous and delicious they look. Gotta try this soon. Thanx for the share 🙂 Wonderful recipe and pictures! I love this idea! 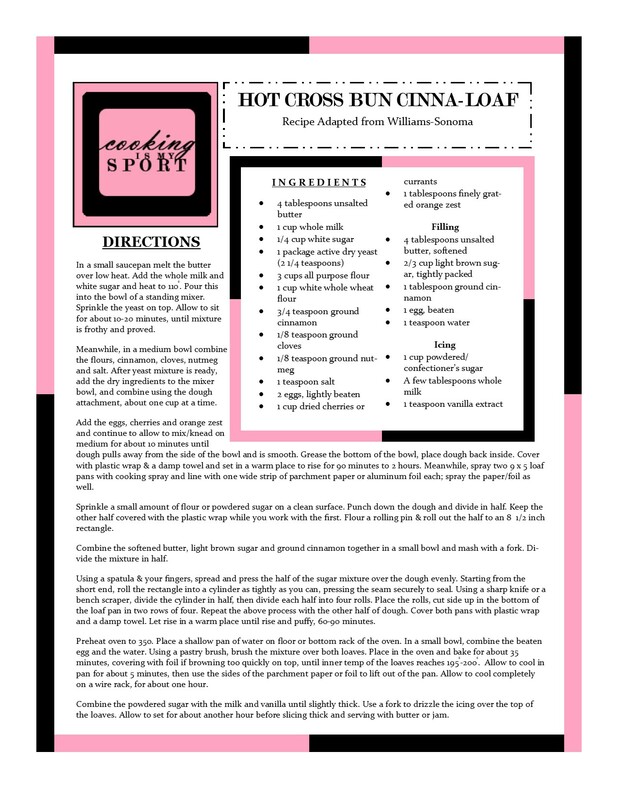 I’ve never made Hot Cross Buns and it sounds wonderful making it as a loaf! I’m really pleased with how it came out Ginger, thank you! This bread is just beautiful and would be perfect on Easter! I hope you had an amazing day. I wish that we were neighbors, so I could get to try your amazing recipes, Jess. I love your bread recipes and everything. 😀 This looks fab! Yummy, I would love to try! It’s a great loaf of bread, I enjoyed making & sharing it. Thanks!